You can’t outgrow the Keekaroo Kids Chair. From 6 months to 250 lbs, the Kids Chair is your stylish seating solution. Made of Rubberwood, the wooden high chair is durable and will last the test of time and the messiest eaters. 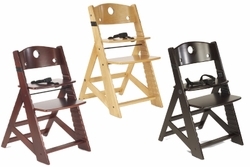 As your child grows, the seat and foot plates can be adjusted to create the perfect seat. The foot plate can turn into a seat plate when your child’s feet touch the ground. The Kids Chair can be your child’s chair at the dinner table, at the computer or anywhere. Keekaroo keeps safety in mind. The Keekaroo Kids Chair is made with a plant based lacquerer finish. It is JPMA certified to the highest ASTM standards for the safety of your child. Features included in the Kids Chair are the depth adjustable seat and footplate, height adjustable seat and foot plate and 3-point positioning belt. The ergonomic design of the backrest allows for a comfortable seating position. If more comfort is required, Comfort Cushions can be added. Available in a variety of colors for the most comfortable seat in the house. Comfort Cushions are made in the USA and are made from a BPA and Latex-Free peel and tear resistant material that offers protection. Comfort Cushions wipe clean with warm water and are impermeable to liquids. Keekaroo is style, function and affordability.